Oh So Shutters are first and foremost, passionate about the quality of your shutters but they are equally concerned about providing the best customer experience. At Oh So Shutters we are proud to say we have the expert knowledge and knowhow to help you make the best choice for your home. 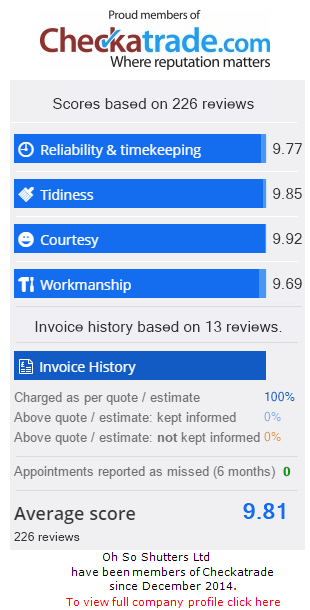 We pride ourselves in offering a personal friendly service; with no pushy sales techniques, working closely with our customers to offer sensitive and sound advice, most of all we let the quality of our shutters do the talking. In the Eastbourne area, in particular, our valued customers have benefited from our exceptional knowledge and understanding of the the city and the surrounding suburbs, including the history, topography, architectural influences, as well as the environmental and economic climate. Eastbourne has an eclectic range of architectural forms. Originally the village of Bourne dating from the medieval era to the 18th century, which consisted of a string of buildings named sea houses where King George the III’s children stayed in 1780. It was a small resort where the contemporary fashion for sea-bathing could be indulged. Unlike other neighbouring towns, Eastbourne was slow to expand from this early development, which was partly due to the economic decline after the Napoleonic Wars and the ownership of 6,000 acres of land by two long established local dynasties. Eventually Eastbourne began to develop its garden city status and between 1861 and 1871 the population doubled leading to the construction of several buildings in various designs and many of the new listed buildings of that era including Hartington Place, Howard Place, Cavendish Place, the railway station and the theatres. Some Georgian houses in Eastbourne still maintain their original features including internal shutters that fold back as leaves into architraves either side of the panelled window surround. The main windows would have decorative hinges and in the service rooms the shutters were planer with strap hinges. Many shutters have since been ripped out, boxed or fixed permanently into the frames, however, more recently, people are reinstalling interior shutters into their homes as more and more people are becoming aware of the true benefits of these versatile window fixtures. Like all our Eastbourne customers, Oh So Shutters are highly influenced by timeless style and elegance and will strive to enhance and and improve your interior spaces, offering professional advice and consideration to your personal, aesthetic and practical requirements.